The function of carbon filter kits is to absorb organic particles and other airborne materials produced by the plant during growth and blooming. The process involves the filtration and evacuation of organic particles and other airborne materials produced by the plant. 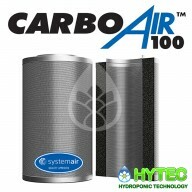 Carboair carbon filters have been developed to filter VOCs (Volatile Organic Compounds) from smaller grow room environments and offer excellent filtration of air without compromising airflow. Hytec supplied CarboAir carbon filters come supplied with a CarboAir™ Filter, extractor fan (options), 5 metres of combi ducting and the three clips need to assemble the kit to the size you require. The pure carbon is activated at temperatures above 1000°C in a humid environment. The process opens the pores of the carbon to give it incredibly high absorption properties of organic particles and other airborne pollutants. The carbon is produced to very high standards in Europe, unlike Chinese filters which often contain cheaper blends and risk water contamination during shipping. Being created in the EU enables better quality control. The carbon is produced to EN12915 which means it is pure enough to be used in food and drink applications. CarboAir carbon filters use an industrial galvanised steel filter casing, Using the highest quality materials enabled it to use the finest mesh. The filter mesh is 55.5% open for the best-unrestricted air flow through the filter. 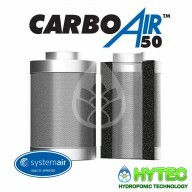 Carboair carbon filters have better flow rates, enabling them to utilise a thicker carbon bed compared to competitors. The top and bottom flanges are pre-formed. The carbon is packed into the casing and then placed onto vibration plates which results in a higher quantity of carbon in the housing without crushing the carbon granules also resulting in no air pockets allowing VOCs to pass through unfiltered. Hytec also supply a vast range of other styles and sizes from many suppliers to meet most needs! Throughout our site, you will find a selection of the best carbon filter kits on the market - including Phresh Carbon Filter Kits, Ram Air Carbon Filter Kits and Mountain Air Carbon Filter Kits. 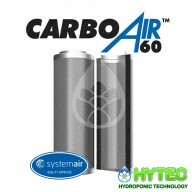 CARBOAIR INLINE 150MM X 740MM 900M3/H CarboAir Inline filter, are designed so you can mount your filter outside your grow room. You can simply duct the air out of your grow room and into your inline filter to scrub the odours. If space is tight it is the perfect solution. 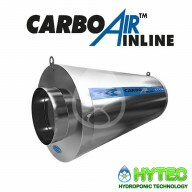 Inline filters ..
CARBOAIR INLINE 200MM X 740MM 1200M3/H CarboAir Inline filter, are designed so you can mount your filter outside your grow room. You can simply duct the air out of your grow room and into your inline filter to scrub the odours. If space is tight it is the perfect solution. Inline filters..